An end is now clearly in sight, said Brexit Minister Dominic Raab. For the Irish Foreign Minister, this date is “realistic”. Britain sets a new deadline for a Brexit agreement with the European Union. 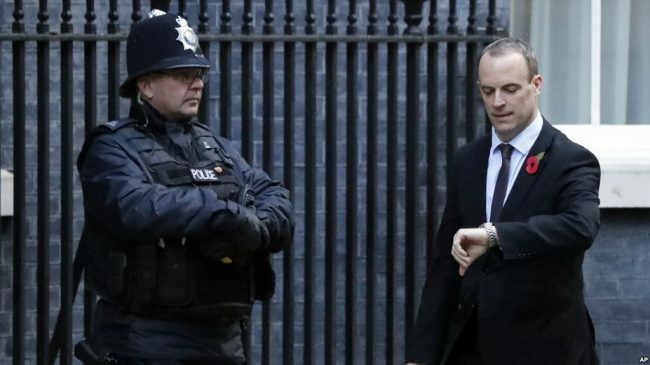 By November 21, the deal should be done with Brussels, Brexit Minister Dominic Raab said in a letter published Wednesday to the deputies of the House of Commons. The letter to the members of the Brexit Committee was dated October 24 but has just been published. The office of British Prime Minister Theresa May did not elaborate the deadline. The agreement with the EU should be reached “as soon as possible”, said May’s spokesman on Wednesday. He did not make any commitments of the date of 21 November. Irish Foreign Minister Simon Coveney said on Wednesday that he considers a deal possible by 21 November. However, that implies that the UK negotiators will increase their commitment by then, he added. Although the bulk of the Brexit agreement stands, the United Kingdom and the EU disagree on the question of how the border between Northern Ireland and Ireland should be regulated after Britain’s exit from the single market and the customs union. Raab wants to visit Northern Ireland on Friday and talk to business people and politicians. Brussels has made a backstop on the Ireland issue as a condition for a withdrawal agreement and about a two-year transitional period in which virtually nothing is to change. Great Britain will leave the EU at the end of March 2019. The Brexit agreement should be well in advance of the date of departure so that the UK and EU parliament have enough time to ratify it. The next regular EU summit will take place in mid-December. A Brexit special summit is planned for mid-November. The date is not yet confirmed, the talks will be held on the weekend of 17/18th of November.